Today I’d like to post my first restaurant review about a unique, fun brasserie that our family enjoyed last summer in Paris. Here in the U.S. we kind of distinguish between a restaurant, a coffee shop, a fast-food place, and a cafeteria. In France and the Francophone world there are brasseries, cafés, bistros, and bars. The direct translation for the French word brasserie is brewery, but La Coupole brasserie in Montparnasse is much more than that. When visiting with an American friend of ours who has lived in Paris for the last 20 years, we asked him to choose someplace very Parisian for dinner. Someplace where locals go. Someplace with delicious French food for us adults, as well as with something the kids would eat. 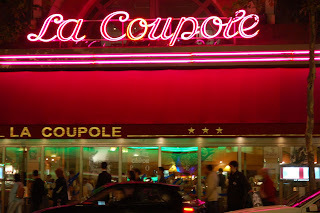 Since he often takes his three children there, we met him at La Coupole on the lively and Cineplex-lined Boulevard du Montparnasse. Do I need to say anything about this dessert? 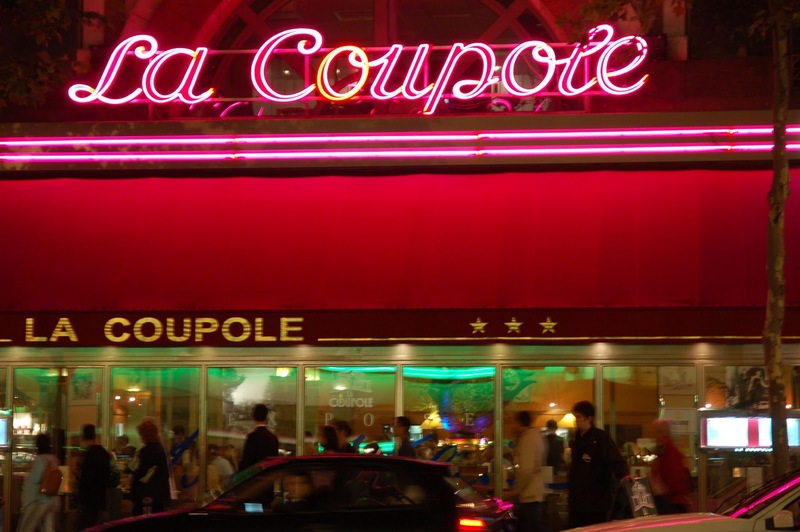 Besides the outstanding food, La Coupole is a Parisian landmark. Established in 1927, famous patrons in the past include Ernest Hemingway, Salvador Dalí, F. Scott Fitzgerald, Picasso and Matisse. Jean-Paul Sartre and Simone de Beauvoir were regulars. Dozens of pictures, drawings, and sketches line the walls of the immense dining room, and legend has it that these pieces of art were given as payment from such artists as Picasso and Matisse! The most famous feature of this art deco restaurant is its 32 painted mural columns, or pillars, that support the dining room. These were painted by students of Matisse and Fernand Léger as well as other modern artists. Families with children will love that the restaurant is brightly lit, spacious, noisy and fun. There is also sidewalk seating if you prefer. We rate this restaurant an A+! The painted columns are famous. Magnifique ! I can only confirm your comments on La Coupole, just a great place ! 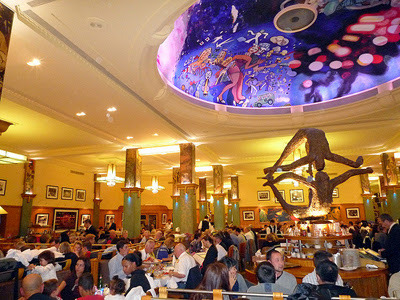 ...and there are many "brasseries" in Paris, but this one is a must (and also for the decoration & atmosphere). I'm simply happy you enjoyed it. The food looks delicious! I will have to give this place a whirl on our next trip. Don't you love being the weirdo taking pictures of everything you eat? I always wonder what the other diners are thinking! Who Needs a Travel Book?